Having collected ol' Shellhead's adventures from the 80's up, there are only two instances I can recall, where the debut of an armour lead to a 'Hell yeah!'. One was the War Machine set of duds and the other was the Hulk-Buster. Now almost in a nodd to Hollywood execs, as if to say, 'Hey, how 'bout these guys throwing down in Avengers 2?' LMBP does a little photomanipulation on a 3D model by Mike Jensen, and the Hulk-Buster armour gets a 'Hell yeah!' once again. Funny how that works. Also Hollywood if you are out there, how about this; 'Hulkbuster vs Stay Puft Marshmallow Man'. Sure it's a one-hit royal rumble, but instant visually iconic moment. I'll leave it with you. Call me. If Stark was forced to not think of anything and leave his mind blank, he'd lose out on that with one, what with all the tech ideas that float around in his head. 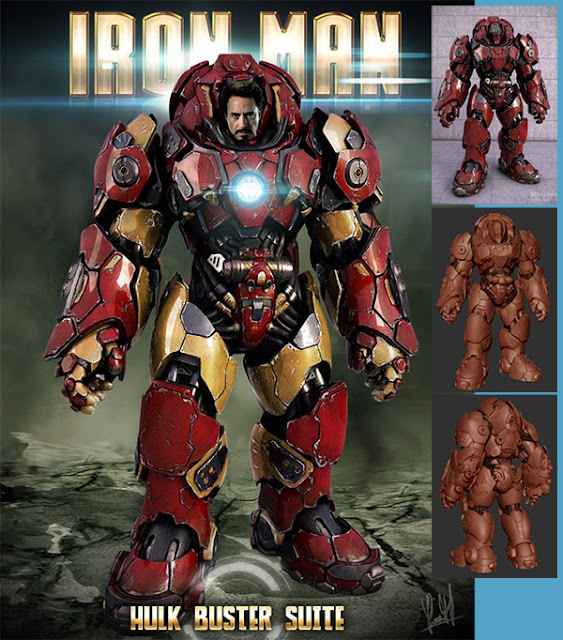 But yeah, a battle against the stay-puft man w/the Hulkbuster armor would be sweet. Hopefully we'll all either see a glimpse of the Hulkbuster suit, or the whole thing in a brief cameo during the this upcoming movie. How insane is this pic? Thatd make a great poster for the movie tho when one thinks about it. Mind, a few years ago this pic wouldve just suited RDj considering the size of his overinflated ego back then! Thanks guys! I hope so to Dale. Still holding out for Ultimo as well, but I'm greedy like that. Karl you are right, a poster of an Iron Man like this would sell itself. I'd still charge folks a quarter though cos hey the power doesn't pay itself. You guys though, it'd be free.